Take time out of the pre-Christmas frenzy to join us for a fun evening of great food, songs and poetry! Come to the lovely Belfrey Hall on Stonegate to meet friends old or new, and have a good time while raising funds for St Nicks – the green heart of York. Thanks to the Big Give Week Christmas Challenge, all donations will be matched pound for pound by the Garfield Weston Foundation. * A delicious two-course plant-based meal, lovingly made from local veg by chef Joe Fennerty of the Food Circle whose ambition is to create a sustainable and fair food system. * Laughter, captivating rhythm and rhyme from St Nicks Patron and York Culture Award winner Anneliese Emmans Dean of the Big Buzz. 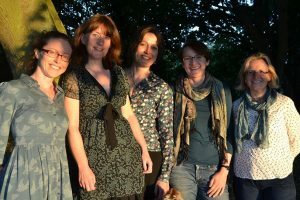 * The Barberellas: five local women who sing a cappella – from barbershop to folk, love songs to protest songs, often with an ecological twist. 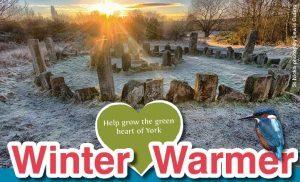 Entry: Booking is essential by paying a £5 deposit via Eventbrite or by cash at the Environment Centre. There will be a suggested donation on the night of £10, but please do feel free to be as generous as you wish!